The automatic garage door in your home will require repairs when it begins to malfunction or does not work correctly. You can ensure that your garage door continues to remain in good working order if you keep it clean and properly maintained. There are also other factors that you need to consider. Scrub the surface of the door with a solution of dish soap and water. This can be done with a soft bristle brush or a car brush. You should clean your garage door up to four times each year. Regular washing of the garage door will prevent the build up of grime and other corrosive elements. Make sure that you do not use chemical cleaners that can damage components of the door. Salt used to melt snow will need to be kept away from the door to prevent corroding door components. The moving parts of roller garage doors will need to be lubricated with a light-weight oil. This includes the springs, rollers, and hinges of the door. You will need to this at least once a year. The best type of oil to use is an oil that is in the form of a spray. If you notice any parts on your door that are loose, they may need to be replaced. The cylinder for roller shutter garage doors will need to have the rollers oiled as well. Pull on the emergency handle on the door when it is in the down position. Lift up on the door and let it slide up the track. If the door seems heavy to lift, a problem may exist with the springs. However, your opener may have a loose chain the needs to be tightened. If the opener for your garage door does not operate from the remote or wall-mounted control, your unit may not have power. Unplug the power cord and plug in another electrical device, such as a light to see if it turns on. If the device does not turn on, check to see if there is a blown fuse or a tripped breaker on your circuit panel. Another option is to verify that the safety sensors are properly set. Sensors not set to detect each other prevent the door from opening. 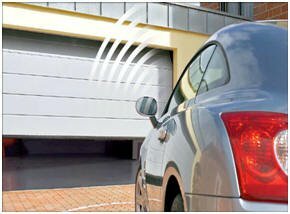 Adjust the position of the sensors to see if your door will open or close.